There are a few categories of Christian books that have hundreds of titles to choose from but only the barest handful that are actually helpful. One such category is the spiritual disciplines. Some books on the disciplines end up advocating mysticism or introducing unbiblical practices. Some completely miss the balance between the descriptive and the prescriptive, essentially calling the reader to do little more than mimic the writer. Whatever the case, there are too many genuinely bad books on this genuinely good subject. Thankfully we have been well-served by that handful of excellent titles, Donald Whitney’s Spiritual Disciplines for the Christian Life chief among them. 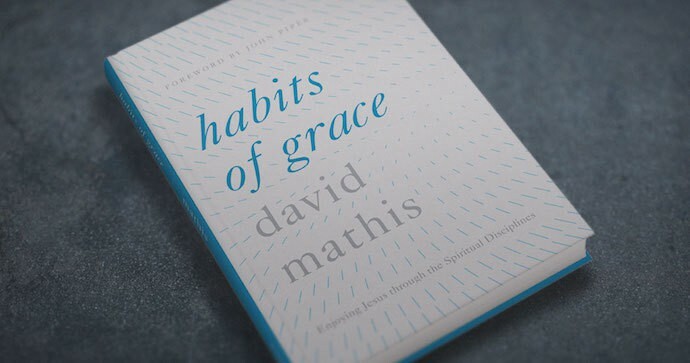 Today, however, we have another good one to choose from with the release of David Mathis’ Habits of Grace, a helpful, biblical, practical guide to this important subject. The book is structured around those three means of grace and each of them receives six short chapters. A short “coda” offers a brief look at three related practices that are sometimes considered spiritual disciplines: evangelism, stewardship of time, and stewardship of money. The simplicity and consistency of Mathis’ format is echoed in the chapter titles which all begin with a verb: Shape Your Life with the Words of Life; Read for Breath, Study for Depth; Warm Yourself at the Fire of Meditation; and so on. Many of the chapters also follow a consistent pattern where Mathis introduces a topic, provides biblical support for it, and then concludes with a series of practical tips or steps. Examples of these practical elements include Five Tips for Bible Memory, Twelve Gospel Passages To Soak In, Five Principles for Lifelong Learning, and Five Suggestions for Secret Prayer. This proves an effective format. One element I found especially valuable in Mathis’ approach is its simplicity. By narrowing all the habits or disciplines into just three means of grace he makes these practices seem possible, even for those for whom this is new territory. Where many books can seem overwhelming, Mathis says “My prayer is that you will not come away exasperated that you simply don’t have time to put into practice all that this book commends. Rather, in its very structure, the book aims to help you see how realistic and life-giving it can be to integrate God’s means of grace into daily habits of life.” In that regard he succeeds well. This book really could set you up for a lifetime of enjoying God through the means he provides. Mathis also succeeds in giving new enthusiasm to those of us who already have well-established patterns of participating in each of these means of grace. I read the Bible and pray daily; I am committed to my church and heavily involved in it. Yet Habits of Grace still challenged me to continue to grow in each of these ways. The biblical support was challenging and the practical tips were illuminating. Both gave me ideas and information for modifying and improving my commitment to those all-important means of grace. Allow me to conclude with the blurb I wrote when I read the book for the first time many months ago: There is not a Christian in the world who has mastered the spiritual disciplines. In fact, the more we grow in grace, the more we realize how little we know of hearing from God, speaking to God, and meditating on God. Our maturity reveals our inadequacy. Habits of Grace is a powerful guide to the spiritual disciplines. It offers basic instructions to new believers while bringing fresh encouragement to those who have walked with the Lord for many years. It is a joy to commend it to you.